Raise your hand if you're excited about repairing the siding on your home. You didn't raise your hand, did you? 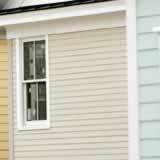 Repairing your siding is a project we all love to avoid. However, the best time to start avoiding repairs is when you are selecting your siding. Vinyl siding tends to be the most budget-friendly choice and the quality of products in this category has increases significantly in recent years. While vinyl products can be vulnerable to the elements, cracking in cold weather, buckling in hot weather, and shattering in hail storms, proper installation reduces the need for vinyl siding repairs. Wood siding offers the most traditional siding choice, but it also requires more maintenance than vinyl and brick. Available in many different styles, wood siding needs regular painting or staining in order to stay durable, typically every five to seven years to help avoid siding repairs. Stucco siding requires a new coat of paint as often as wood, but has greater overall durability because it won't rot or burn. Most stucco applications today use synthetic stucco at a cost nearly as high as brick with only a 10-year limited warranty. While brick siding provides the ultimate in durability, the material and labor costs are high. But if you've got the budget, brick needs no painting or staining and very little maintenance. Outside of major damage from a severe storm or out-of-the-ordinary situation, brick siding repairs should be nonexistent. Any of these choices can provide your home with excellent protection and a beautiful finish for years. Whichever siding option you choose, make sure the product is installed carefully by a professional for the greatest durability. What's wrong with my vinyl siding? Can roofers replace rotted fascia trim?